Groups Chattyanzud as Aika, Natalie as Fina, BWH Comics as Galcian, Celine as Vyse (MAGfest 2018). Wig Arda Wig: Jeannie in Maroon (CL-002) or Crimson (CL-003). I can't find the confirmation email and lost the rest of the information. Don't "check out as guest," kids! 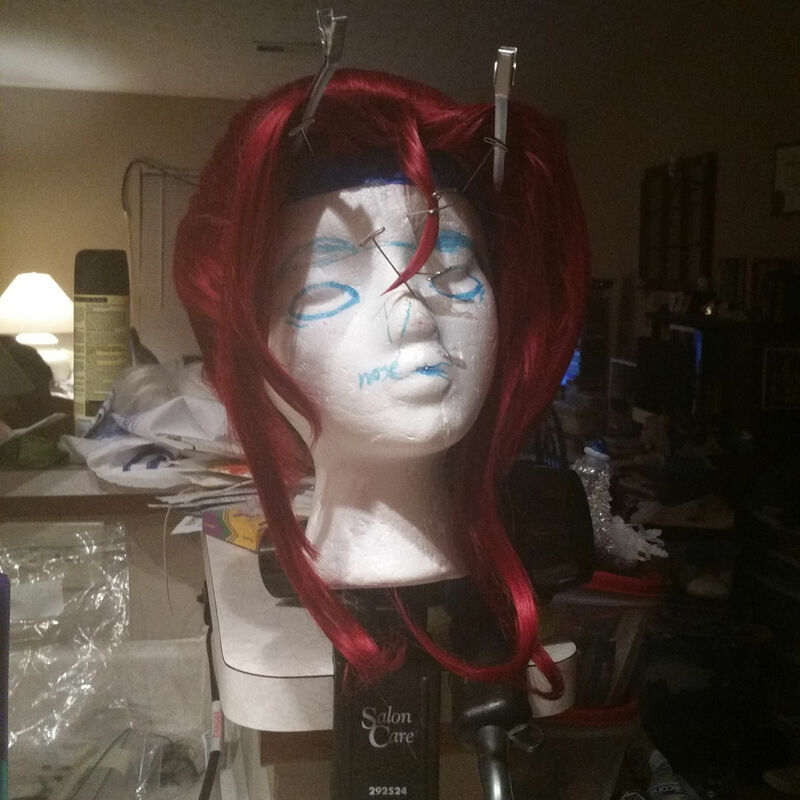 I originally bought this wig thinking I was going to be Pyrrha for Katsucon 2015. Because that didn't happen, I had set it aside thinking it could possibly work for this version of Belleza. Special Makeup I didn't use anything special or new per se, but Kenna did comment on my eyeshadow. I layered a bunch of teals and blues; definitely used the Urban Decay Spectrum and Distortion palettes to create depth. Patterns For this one, I had to completely invent a stretch wrap for the top. You'll see in the photos that I used my Benjamin Franklin stretch fabric (don't ask) (Nova) (Nova made me do it) to drape and construct the bustline. 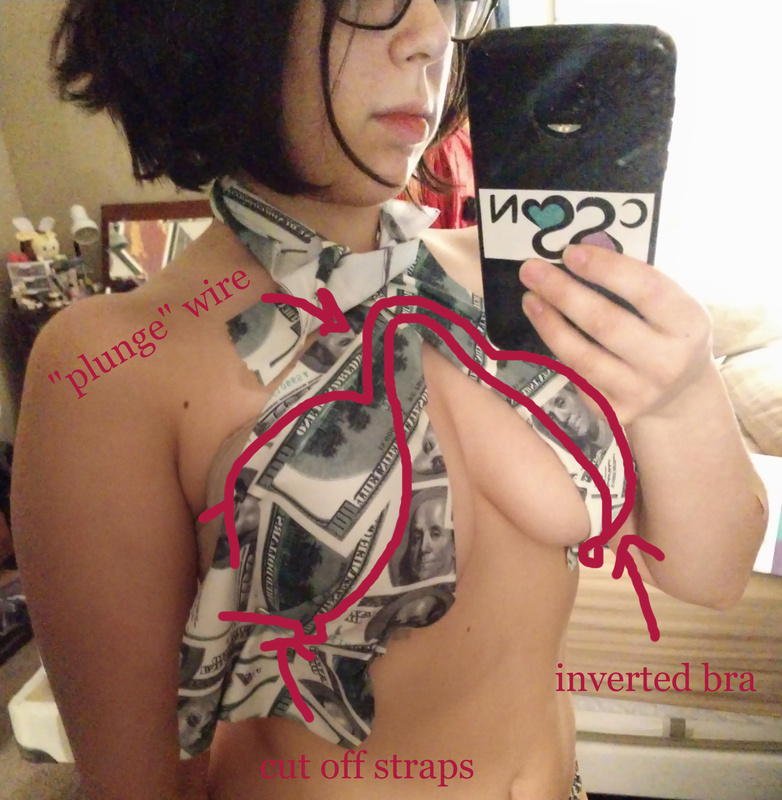 Once again, I used the inverted plunge bra technique to create a pocket that would lift and be full coverage. No matter how I tried, the pant legs didn't want to attach to the elastic of the bottoms properly. I have since perfected the elastic technique and I know now what I was doing wasn't quite right. I need to sew the elastic to itself better and always do the math for measurements. 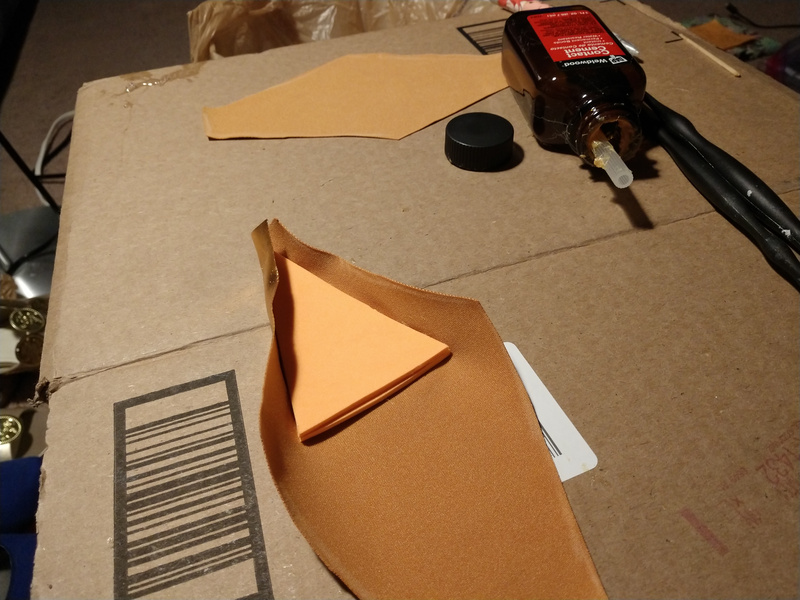 Also, the top was crafted so that I wouldn't have to use any sort of tape or glue to hold it together and would still get a cleavage effect. On the day of, being that my weight had fluctuated juuuust enough from the time I had finished the draft, I found that I needed tape to secure the bottom. I love the effect of the floats, and I think that bronze color was perfect for the accessories. I'm very happy with the overall look. Definitely the elastic on the bottoms. I also didn't finish a lot of the seams properly. I would repaint the red gems or actually make them gems. I'd also like to make some actual shoes instead of just rewearing from another outfit. Not going to lie, I also wasn't very happy with my body when I had the photos taken, but I'm trying to accept that the "differently" I want to achieve is holistic health. Sure! But only with a group. Dancer? Check. Antagonist? Check. Kind of a side character? Check. Promised Ben I'd cosplay from it with him? Check. Looks like the types of characters I wanted to be when I was a kid? Check. Yeah, okay, I'd do the default, but when there's a dancer version, WHY? Elephant in the room: Yes, everyone who wasn't either a huge Skies fan thought I was cosplaying a random Gerudo. Yes, I know the design is similar, and yes we took bets as to how many people would guess that I was a Gerudo. Yes, I did win that bet, and no, I haven't cashed it in yet.